With many years of experience behind her Co Founder of CHRISTAN, Chris Pietraszek runs a number of craft class workshops at CHRISTAN Farm in Bindoon. 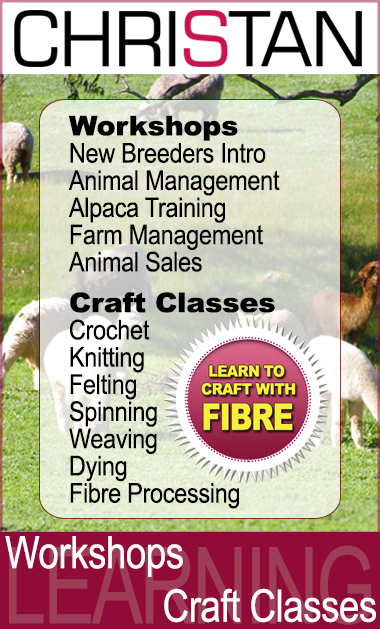 All Workshops are advertised locally, as well as on our website. Please contact us to book your place in a class. We have a minimum and maximum number of places available for participants in each workshop class. It is necessary to fill the class with a minimum number of participants before a workshop class can commence. When the class is full all participants are advised. You can Pay online for your workshop class, however it is best to contact us prior so we can advise if the class you are interested in fully booked until the next class session date. Your booking and payment (by bank transfer or PayPal online) guarantees your seat in the next available class date that is not already fully booked and sold out. We are sorry we are unable to offer refunds for workshop classes due to limited seats available for each class, If you are unable to make it to your pre booked class, we cannot fill you spot on short notice, Other interested participants have been pre booked in following class sessions so we can reserve the seat especially for you on the originally chosen class date. You can sell or give your reserved workshop class seat to another person, this is entirely up to you. We cannot sell it for you. Please notify us with the name of the person who will be taking your place in the class. Please remember to give the other person your payment receipt to bring with them to the class. We are sorry we are unable to offer refunds, credits or exchange your workshop class for a different workshop class or exchange it for other products or services, for the same reasons stated above. If you are unable to make it to your pre booked class, we cannot fill you spot on short notice, Other interested participants have been pre booked in following class sessions so we can reserve the seat especially for you on the originally chosen class date. You can sell or give your reserved seat for your class to another person, this is entirely up to you. We cannot sell it for you. Please notify us with the name of the person who will be taking your place in the class. Please remember to give the other person your payment receipt to bring with them to the class. Please make sure you or a person of your choice can attend the pre paid and booked workshop class for the date you originally chose.